Lactate activates mTORC1 signaling to suppress Atp6v0d2 expression in macrophages. (A–C, E, and F) Atp6v0d2 mRNA expression was determined by qRT-PCR. (A and B) LLC tumor-conditioned medium (TCM) was collected after 5 days culture of LLC cells (100% confluence). BMDMs were stimulated with LLC TCM (A) or a concentration gradient of LLC TCM (B) for 6 hours. (C) BMDMs were stimulated with medium, LLC TCM, or boiled LLC TCM (b-TCM; 100°C, 5 minutes) for 6 hours. (D) Lactate concentration in LLC TCM was determined. (E) BMDMs were stimulated with a concentration gradient of lactate for 6 hours. (F) BMDMs were stimulated with LLC TCM alone, or with the addition of different doses of 2-cyano-3-(4-hydroxyphenyl)-2-propenoic acid (CHC), a monocarboxylate channel transporter inhibitor. (G and H) Representative histograms (G) and bar chart (H) show the mean fluorescence intensity (MFI) for pS6 expression on macrophages that were starved with Earle’s balanced salt solution (EBSS) for 2 hours, followed by replacement with fresh medium (control), or fresh medium with lactate, b-TCM, or TCM for 1 hour. (I) BMDMs were starved with EBSS for 2 hours, followed by replacement with fresh medium in the presence of lactate (40 mM) or complete TCM for the indicated times. 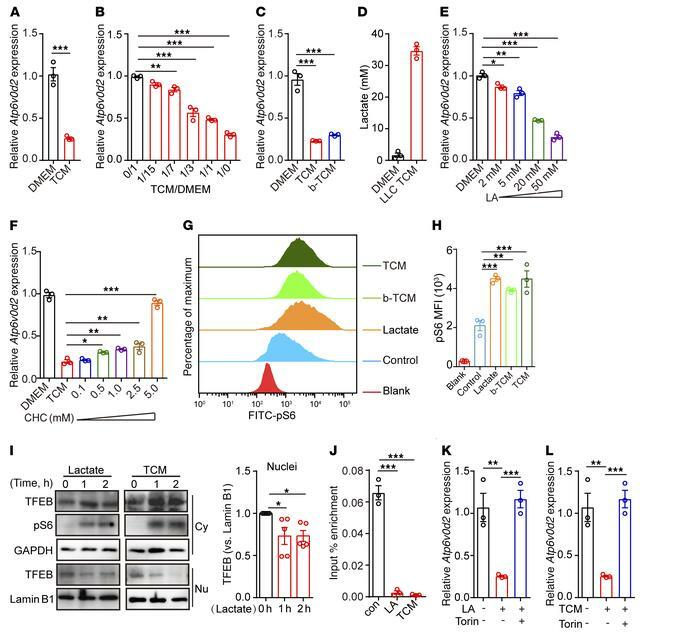 The amounts of nuclear-cytoplasmic fractionation of TFEB and pS6 were determined by immunoblot and amounts of TFEB in the nuclei were quantified relative to lamin B1. (J) RAW264.7 cells were stimulated with lactate (40 mM) or TCM for 4 hours and the binding of TFEB in the Atp6v0d2 promoter was determined by chromatin immunoprecipitation. (K and L) BMDMs were stimulated with lactate (K) or TCM (L) for 6 hours in the presence or absence of 15-minute pretreatment with Torin (1 μM). Atp6v0d2 mRNA expression was determined by qRT-PCR. Data are representative of 3 independent experiments (A–I). Data were assessed by unpaired Student’s t test (A), 1-way ANOVA with Turkey’s test (B, C, E, F, and L) and are represented as mean ± SEM. *P < 0.05, **P < 0.01, ***P < 0.001. LA, lactate.